A man has been arrested on suspicion of stabbing a 24-year-old to death during a mass brawl in Manchester city centre. 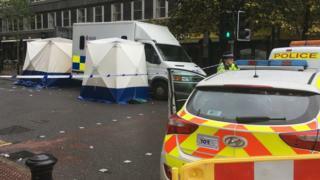 The victim, from Birmingham, died after a "large fight" spilled out from Suburbia nightclub into John Dalton Street early on Saturday. The 29-year-old suspect was also detained on suspicion of attempted murder and violent disorder, Greater Manchester Police said. Five other men held over the brawl were released pending further inquiries.